"Dragonball Z: Budokai is the ultimate fighting game for followers of the original cartoon series but will everyone else understand?" The PSOne was once flooded with dozens of games that were based on early morning cartoon shows such as Pokemon and the Whacky Races and it's finally time for the PlayStation 2 to be graced with one of the most popular cartoon series from Japan, Dragonball Z. If you're over 25, then you probably don't know who or what Dragonball Z is and I'm guessing that most older gamers don't want to wake up around 7am on a Saturday morning to watch the latest episode of the cartoon show. Fortunately for you, I've managed to catch one or two episodes of this strange Japanese cartoon show and let me say that the game is almost a carbon copy of the series. Dragonball Z: Budokai is a fighting game and features all the same characters from the Dragonball Z series that include Goku and Gohan, just to name a few and they look almost identical to their cartoon counterparts. The gameplay of Dragonball Z: Budokai is extremely easy to learn and it should be noted that this game seems to be aimed at a younger market so older gamers will probably not get the same enjoyment from this title. The characters are controlled by either the analog stick or the directional buttons and there are a variety of different basic manoeuvres such as kick (Triangle), Ki Blast Wave (Circle), Guard (X) and punch (Square) that each character can perform. 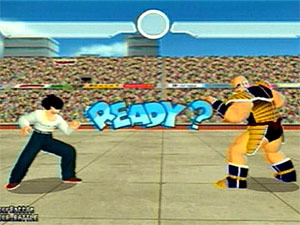 Unlike other fighting games, the developers have also used the R1 (Punch and Kick) and R2 (Guard & Punch) to add to the gameplay of the game and is quite an unusual combination. 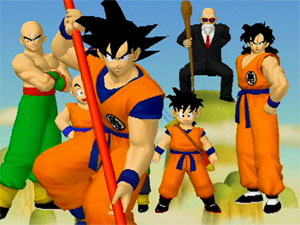 As with all fighting games, Dragonball Z: Budokai features a variety of different combo's and super moves to help add some spice to the gameplay. The game also features an energy bar that builds up as you play and releases a powerful fireball at your opponent that can be used throughout the game. However, the more energy you raise, the more powerful your fireball becomes. In order to pull off a super combo, you must release your energy at the end of a multi-punch or multi-kick combo and your character will automatically perform their super move which is quite impressive. 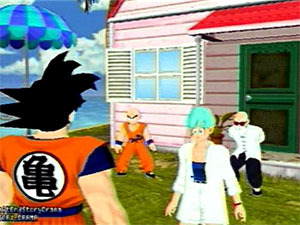 The game also supports a variety of different gameplay modes that include story mode, duel, world match and practice but the main style of gameplay is the story mode and revolves around the characters from Dragonball Z. The story mode option also treats gamers to various cinematics that are based straight out of the cartoon series, like alien invasions or evil geniuses plotting to take over the world. Unlike other fighting games, the more matches your characters win, the more powerful their special moves become, such as Goku's Super Saiyan combo that makes him one of the most powerful fighters on the planet. You are also rewarded with skill cards during the game and there is over forty to collect but unfortunately you can only assign 7 per character at a time. The beauty of the skill card system is that you can virtually customise your characters to make them the perfect fighting machine. Graphically, Dragonball Z: Budokai will scare quite a few gamers away from this title because of the simplistic graphics but little do these gamers know that this is what the animation in the television series looks like and due to the nature of the animation in the cartoon series, the characters look quite flat and boring but fortunately are extremely colourful. The backgrounds in the game are almost non-existent and whenever there is a background, it looks quite plain and lack less. Fortunately, all the characters in the game are extremely well animated and the game maintains a perfect 60 frames per second. 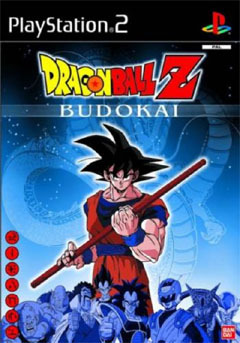 Musically, Dragonball Z: Budokai features the same music from the cartoon series which is the hyperactive Japanese style of cartoon pop that I'm sure the kids will thoroughly enjoy. Although the narrator in Dragonball Z speaks Japanese, there are subtitles for those of us that don't know Japanese but fortunately it suits the game perfectly. The characters shout all the way through the game and you will hear lots of "GOKUUUUU!" and bad character acting like "You've just made me very angry!" that truly pays homage to the original television series. When it comes to fighting and battles, there are enough sounds of punches, kicks, blocks and fireballs to keep even the most unenthusiastic gamer happy. Dragonball Z: Budokai is a strange game that may unfortunately fall flat on the Australian gaming market because of the limited graphics and annoying sound effects. However, those that enjoyed the original cartoon series and especially children will get a blast out of this title and would make the ideal game for the summer holidays.